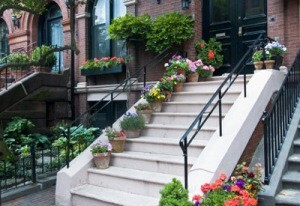 Living in the city can impact how much gardening you can do. Here are 10 tips for urban gardening. Space is at a premium for most gardeners, but especially for people living in large urban areas. A few may have limited access to a small backyard plot, but most consider themselves lucky if they have a small balcony or rooftop terrace on which to grow plants. If you live in a large city, you can still grow own edibles and flowers, you just have to get a little creative. Here are some tips for making the most of the little space you have. If you live in a condominium or a town home, be sure you receive approval from your co-op board or HOA, (or if you rent, your landlord) before planting or modifying your balcony or patio space in any way. Most have very specific rules in place regarding gardening and landscaping - for example weight loads for balconies, and what type of alterations, if any, can be made to exterior walls. A small corner on a balcony can usually accommodate several 2 x 2 foot wooden boxes (6-inches deep) for growing vegetables and flowers. Fill them with a light weight potting soil and make an attractive display by stacking them at different heights using concrete blocks. For climbing plants, attach a vertical frame to the side of the boxes and tack on some netting. Vegetables require plenty of sunlight - at least 6 hours or more a day. What you can grow depends on how your outdoor space is orientated to the sun. Crops like tomatoes, peppers, and beans will be happiest in a warm, light-filled exposure to the south or west. Lettuce and root vegetables need less sun and can be grown in northern and eastern exposures, where sunlight is more limited. To maximize the amount of sun your plants receive, try using mirrors, light colored paint, and shiny accessories in the space to help capture and reflect the light. Kitchen compost pails are the perfect way to recycle food scraps in apartments, small homes, and condominiums, because they allow you to produce compost directly in an airtight pail, which eliminates the odors. Larger systems could be placed on a rooftop, or - if the law allows - on a fire escape for shared use by several neighbors. 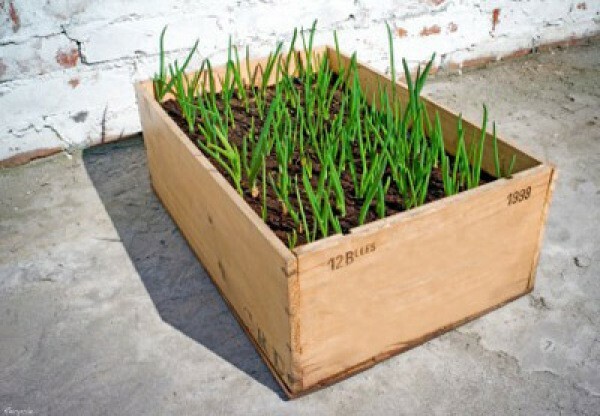 For the more adventurous types, a shallow 2 x 2 foot box located in a broom closet is adequate space for vermicomposting (composting with worms). Worm boxes placed outdoors in colder climates need to be well insulated. Be sure to consider your neighbors (and their pets) when planning your garden space. More than likely your garden will be considered a welcome addition, providing that your plants don't block any scenic views and your container garden doesn't "rain" down on your neighbor's balcony every time you water your plants. The latest trend in gardening is to mix flowers and vegetable crops within the same container. This is great news for gardeners with limited space, and easy to do as long as you choose plants that have similar overall growing requirements (e.g. both need full sun). When designing containers, the traditional concept of thriller (a "look-at-me" plant), fillers (middle level plants that fill in the gaps), and spillers (the trailing elements) still applies. Look for dwarf varieties of vegetables that are specially bred to grow in containers. Trees and plants growing near busy city streets need to be able to endure constant exposure to soot, salt, car exhaust, and other toxins. They must also be able to withstand heat from the pavement, drought-like conditions, and tolerate growing in acidic soils. Tree species like oak, ash, elm, ginkgo, linden, and gray birch, are considered more "pollution-tolerant". For flowers, native species are usually more adaptable to sparse conditions. If you want to plant roses, choose some of the heartier Rugosa varieties. Keep the foliage of your trees and plants clean and healthy by occasionally spraying them with water or wiping their leaves clean with a damp sponge. A few well-placed dwarf varieties of apple, plum, pear, and cherry trees can make an attractive backdrop while giving you a delicious harvest. These small, attractive trees reach a height of 5 to 7 feet and bear fruit quickly. Figs, citrus, and soft fruits like strawberries and blueberries also do well in containers. Check the pollination requirements of each fruit. You may need more than one variety unless the tree is self-fertilizing. Make sure you use planters with wheels to make moving and rotating heavy pots easier. If your railings wide and flat, simply set a railing box on top of it and bolt it securely into place. Holders are also available for hanging standard size boxes on metal railings. Hang them on the outside of your railings to save balcony space. Hang them on the inside if you're worried about things falling to the ground. Use window boxes to grow dwarf vegetables like tomatoes or peppers and your favorite herbs. Some easy-care choices are sage, chives, thyme, oregano, and basil. If you're above the first floor, be sure to put a drip tray or saucer underneath your pots and planters to prevent any excess water from dripping down below. I have over half an acre and I am forced to grow in containers due to a highly invasive Bermuda grass. Your article covers some subjects I hadn't considered before. Thank you. I'd like to offer a couple of tips concerning the use of food scraps for composting. It's a great idea. Don't forget to include coffee grounds! I've read a lot on the subject. It seems that the grounds offer little nutrition to the soil, but they do lighten up the soil and make it so very workable. When adding food scraps, be sure that you never include any animal products. No meat, bones, grease, eggs, etc. You wouldn't want your flower and vegetable containers invaded with rats, raccoons and flies.